James Manwell is a professor of Mechanical Engineering the University of Massachusetts and the Director of the Wind Energy Center there. He hold an M.S. in Electrical and Computer engineering and a Ph.D. in Mechanical Engineering. he has been involved with a wide range of wind energy research areas since the mid 1970's. These range from wind turbine dynamics to wind hybrid power systems. His most recent research has focused on the assessment of external conditions related to the design of offshore wind turbines. he has participated in activities of the International Energy Agency, the International Electrotechnical Commission and the International Science Panel on Renewable Energies. He lives in Conway, Massachusetts. John McGowan a professor Mechanical Engineering at the University of Massachusetts and the co-Director of the Wind Energy Center there. He holds an M.S. and a Ph.D. in Mechanical Engineering. During his forty plus years at the University he has developed and taught a number of fundamental undergraduate/graduate engineering courses in renewable energy and energy conversion. His research and graduate student supervision at UMass has produced approximately 200 technical papers in a wide range of energy conversion applications. His recent research interests in wind engineering have been concentrated in the areas of wind system siting, hybrid systems modeling, economics, and offshore wind engineering. Professor McGowan is a Fellow of the American Society of Mechanical Engineers (ASME) and editor of Wind Engineering journal. He lives in Northfield, Massachusetts. Anthony Rogers holds both and M.S. and Ph.D. in Mechanical Engineering from the University of Massachusetts and was formerly a senior research engineer in the Renewable Energy Research Laboratory (now the Wind Energy center) there. He is presently a senior engineer at DNV Global Energy Concepts. He has had a long career in the wind energy field, and has been involved with a wide range of topics. These have included wind turbine monitoring and control and the application of remote sensing devices. He lives in Amherst, Massachusetts. Features new and updated end of chapter exercises, illustrations and technical appendix on data processing, including information on random data, statistical measures, correlations, power spectra and power spectral densities, and data processing issues. Two new chapters on Data Collection and Analysis and Wind Turbine Design and Testing, plus additional material covering the aerodynamics of vertical axis wind turbines (VAWTs), computer codes and electrical grid related issues. 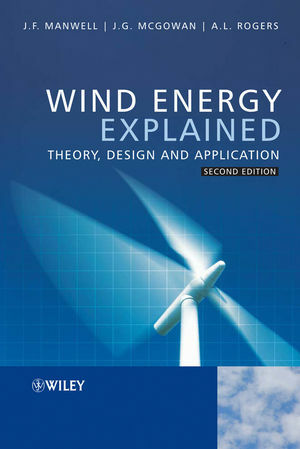 Comprehensive and accessible coverage of every aspect of wind energy, fully revised.